Now available: annual bibliographies starting in 1960, 1970, 1980, 1990, followlinks. See also: 2003, 2004, 2005 and 2007. BJF, 2005, The Discovery of Giardia, The Microscope 53 (4): 147-153 (published in 2006; based on opening address at Amsterdam conference, 2004). BJF, 2006, Absolute Zeno (article on e-learning at Leicester), Laboratory News: 16, January issue. 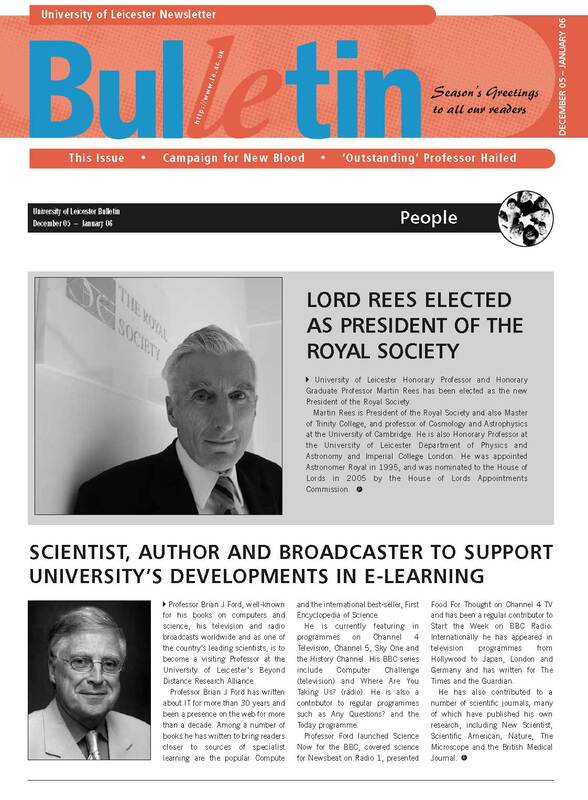 Report, 2006, Scientist, Author and Broadcaster to support University Developments in E-learning, University of Leicester Bulletin: 7, January. [See also entire issue as PDF]. Kinnear, Judith and Martin, Marjory, 2006, reproduce Brian J Ford study of Robert Brown microscope in use [in] Nature of Biology, 3rd edition book 1: 7. Australia, Milton: John Wiley & Son. BJF, 2006, Contributions to Weird Weapons, the Axis and Weird Weapons, the Allies, producer Martin O'Collins, Darlow Smithson TV, History Channel 2100-2300h ET, 16 January, repeat. (DVD copies in archive). Pearson, Mark, 2006, Village hall coul be built at last, Peterborough Evening Telegraph: 25, 8 February. BJF, 2006, Contributions to Weird Weapons, the Axis, producer Martin O'Collins, Darlow Smithson TV, History Channel 2000-2100h EST, 8 February, repeat. (DVD copies in archive). BJF, 2006, Contributions to Weird Weapons, the Allies, producer Martin O'Collins, Darlow Smithson TV, History Channel 1200-1300h ET, 9 February, repeat. (DVD copies in archive). BJF, 2006, Bird flu, the next pandemic? Encyclopaedia Britannica Yearbook 2006: 490, Chicago, Encyclopaedia Britannica. How dumb can you get? Chaplin Theatre, 1100-1145h, 13 February. World's worst cruise photographs, Chaplin Theatre, 1115-1200h, 14 February. Come behind the scenes, Chaplin Theatre, 1100-1145h, 15 February. Bad lectures, and how to give them, Chaplin Theatre, 1100-1145h, 17 February. Question time, Chaplin Theatre, 1430-1515h, 19 February. Cruise menu of the Future, Chaplin Theatre, 1430-1515h, 20 February. Funny you should ask, Chaplin Theatre, 1100-1145h, 13 February. Mysteries of Water, Chaplin Theatre, 1115-1200h, 13 February. Cruising Hong Kong, China; Manila, Phillipines; Darwin, Northern Territories, Australia; Cairns, Queensland, Australia; Whitsunday Island, Barrier Reef, Australia; Brisbane, Queensland, Australia; Sydney, New South Wales, Australia. 12 - 27 February. BJF, 2006, Pioneering observations of parasitic protozoa, PowerPoint presentation at BTF Microbiology, Sydney, Australia, 1130-1220h, 27 February. BJF, 2006, Imaging of cell structures, specimen sections and algae using single-lens systems, 1130-1200h, presentation at Department of Microbiology, University of New South Wales. BJF, 2006, Mysteries of the blood clot, Olympus 'Illumin8' magazine: 3, February. Audesirk, Teresa; Audesirk, Graham & Byers, Bruce, 2006, include Brian J Ford micrograph of erythrocytes through Leeuwenhoek microscope [in] Life on Earth, 4th edition, ISBN 0131860437, New Jersey: Pearson Educational. BJF, 2006, vote of thanks to Professor Clive Mulholland inaugural lecture, Jordanstown Campus, University of Ulster, Belfast, 24 May. Weinbach, Marcel, 2006, cites BJF on Robert Brown (with colour photograph of microscope) in PhD thesis Die Brownse Berwegung in der Arbeit von Louis Bachelier: 2, 19. June. BJF, 2006, The World's Worst Microscopy, illustrated PowerPoint presentation to Microscopical Society of Southern California, New Roads School, Los Angeles, 1000-1100h, July 1. A portable microscope from Poland, 1000-1030h, 10 July. An Evening with Brian: How Tomorrow's Lifestyle fosters Yesterday's Pestilence, 2000-2100h, 10 July. Microscopy of Taraxacum - learning from experience, 1130-1200h, 11 July. The world's worst microscopy, 1600-1630h, 12 July. Chicago: McCrone Research Institute, Talbott Hotel. Report, 2006, Brian J Ford and asbscission on the curezone.com website, 11 July. BJF, 2006, Revealing the ingenuity of the living cell, Biologist 53 (4): 221-224 (August). BJF and Stokes, D. J., 2006, Bug's-eye view (illustrated paper on the microscopy of Cimex), InFocus, Royal Microscopical Society, 3: 4-15 (August). Lipsett, Anthea, 2006, You're not so clever, are you? 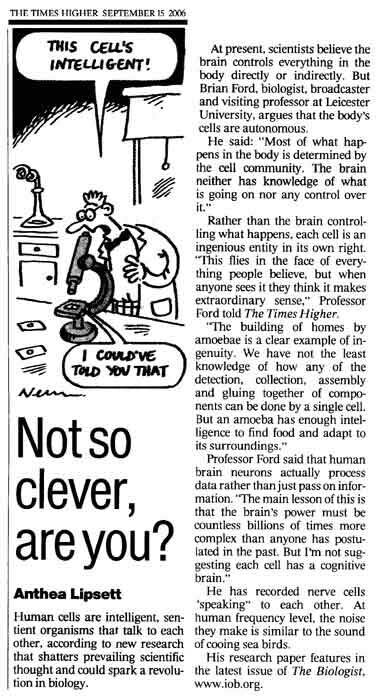 (feature on ingenious cell paper from biologist, q.v., with Newman cartoon), Times Higher Education Supplement: 2, 15 September. BJF, 2006, Haemostasis and microscopy, Clinical Laboratory International, 30 (5): 12-13 (September). 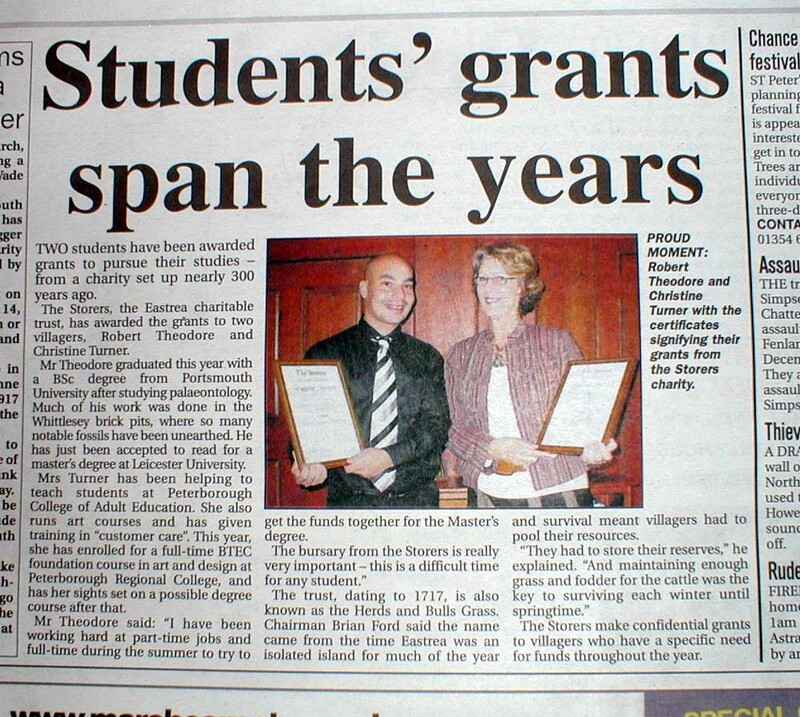 Report, 2006, Students' grants span the years, (report on Storers' awards, with colour photograph), Cambs Times: 9, 6 October. BJF, 2006, Collision course - how science is abused by the media, Illustrated presentation to Cambridge Society for the Application of Research, Churchill College Cambridge, 1930-2000h, 9 October. BJF, 2006, Do angiosperms learn lessons from life? The Microscope 54 (2): 51-59. Report, 2006, The Storers Awards, Discover Whittlesey magazine: 17, October. BJF, 2006, Beyond the Human Genome, the untold Legacy of the Genetic Revolution, illustrated PowerPoint presentation to Cambridge Society for the Application of Research, Churchill College, Cambridge, 20 November. BJF, 2006, Illustrated lectures for Classic International Cruises: M/V Athena, St Petersburg and Baltic cruise:Photography with Digital Cameras, 1645-1745h, Auditorium theatre. How Dumb can you Get? 1645-1745h, Auditorium theatre. Secret Language of Life, 1645-1745h, Auditorium theatre. The Cruise Menu of the Future, 1645-1745h, Auditorium theatre. Question Time, (extemporised question and answer session) 1645-1745h, Auditorium theatre. Cruising: Dublin, Ireland; Oslo, Norway; Copenhagen, Denmark; Tallin, Estonia; St Petersburg, Russia; Helsinki, Finland; Kiel, Germany; Falmouth, Cornwall; Dublin, Ireland. 30 July - 13 August 2006. Cruising: Southampton, England; Funchal, Madeira; Santa Cruz, Tenerife; Las Palmas, Gran Canaria; Arricife, Lanzarote; Agadir, Morocco; Casablanca, Morocco; Lisbon, Portugal; Southampton, England. 21 November - 4 December 2006. Hagan, Lucy, 2006, quotes Brian J Ford [in] TV Carol's X-Rated OAP talk, The Sun, 6 December. BJF, 2006, The Autumn Revolution, Biologist 53 (6): 300-304, December. Return to previous year, 2005 or move on to 2007.